(CBS News) NASA's Curiosity Mars rover, slowly nearing its initial science destination where multiple types of terrain come together, has found outcrops of conglomerate rocks made up of eroded gravels that scientists believe were transported across the floor of Gale Crater by a "vigorous" flow of ankle-to-hip-deep water in the distant past. It's the first observation of its kind on Mars, showing that an alluvial fan photographed from orbit was, as suspected, formed due to the action of flowing water that entered the crater through a 100-foot-deep, 2,000-foot-wide channel dubbed Peace Vallis that cuts through the crater rim and then fans out across a gentle 1-degree slope toward Curiosity's landing site. "This rock is made up of rounded gravels in a matrix that's very sand rich," Rebecca Williams of the Planetary Science Institute in Tucson, AZ, told reporters. "And these attributes are consistent with a common sedimentary rock type called a conglomerate. ... Over time, erosion is working on that rock face and liberating some of the gravels and they're falling down and accumulating in a pile at the base of that outcrop." Geologists are interested in such gravels, she said, because "they tell you that those particles had been subjected to a sediment transport process, either by water or wind." "And so typically, you start off with a very angular rock fragment and as it's transported, it's bouncing along, interacting with other grains and the surface, and that wears away the edges until you have a very smooth surface. The key components of these gravels are the rounded shape and also the size. These are too large to be transported by wind. The consensus of the science team is these are water transported gravels in a vigorous stream." Bill Dietrich, a co-investigator at the University of California at Berkeley, said the gravel size and the distance the rocks were were transported indicates the flow "might have been from ankle-to-hip deep and maybe moving a few feet a second." In a news release summarizing the findings, Dietrich said "plenty of papers have been written about channels on Mars with many different hypotheses about the flows in them. 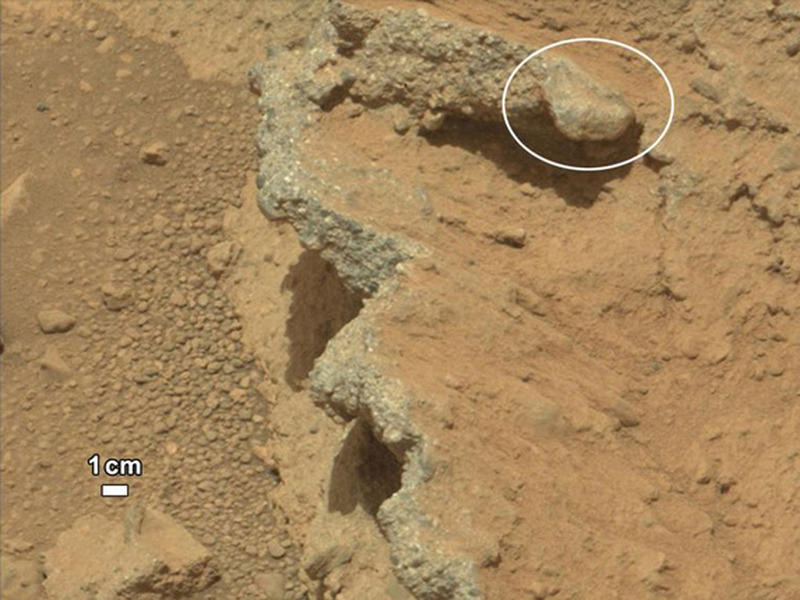 This is the first time we're actually seeing water-transported gravel on Mars. This is a transition from speculation about the size of streambed material to direct observation of it." But seeing such a structure from orbit is one thing. Seeing the actual rocks made up of debris that was once swept along shallow channels making up the fan is gratifying to the science team because it provides "ground truth" for the observations made from orbit and shows Curiosity landed in a scientifically rich site. The Curiosity rover was built look for signs of past or present habitability, at least as it is known on Earth, which requires water, a source of energy and organic compounds. The rover is equipped with sophisticated instruments to look for carbon compounds, but no such observations have yet been attempted. But the discovery of conglomerate rocks in the outflow of the ancient channel that fed the alluvial fan indicates the science team is on the right track and that water played a significant role in the crater's history. Curiosity currently is on the way to an area known as Glenelg, where three different types of terrain come together. "We've driven quite a long way," Grotzinger said. "Yesterday, we had our longest drive of quite a bit over 50 meters and we are most of the way now to Glenelg. The science team is busy trying to choose a target to collect material, probably wind-blown sand, that we will put into (the rover's) chemical laboratories for the first time on this mission." That work will take two to three weeks, he said, and scientists are taking their time picking out an appropriate sample acquisition site. In the meantime, "as we were driving along on the way to Glenelg, we encountered some really interesting outcrops that were surprising to the team," Grotzinger said of the conglomerate outcrop. "To us, it just looked like somebody came along the surface of Mars with a jackhammer and lifted up a sidewalk that you might see in downtown LA, sort of like in a construction site. "What represents the consensus opinion of the science team is that this is a rock that was formed in the presence of water. And we can characterize that water as being a vigorous flow, on the surface of Mars. We're really excited about this because this is one of the reasons that we were interested in coming to this landing site, because it presented from orbit quite a strong case that we would find evidence of water on the ground." As it turned out, he said, "we landed on this (alluvial fan) and it makes a great starting point for us to do more sophisticated studies using the rover payload."